Coyotes, foxes, bobcats and other varmints are always looking for an easy meal! Send out a dinner invitation to all the predators in your favorite hunting haunt with a custom Rodent Distress call from Hemlock Ridge Calls. This call is a favorite among predator hunters. It duplicates the high pitched chips of a mouse, chipmunk and other rodents. It is an extremely effective predator & varmint call. 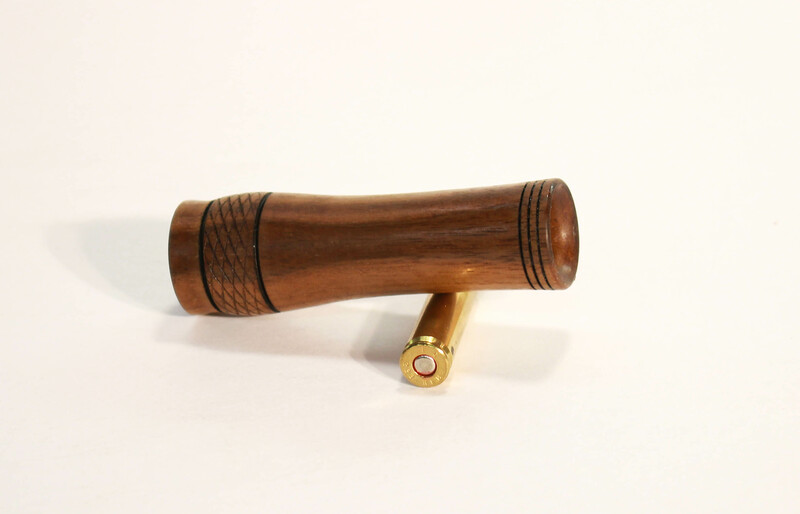 This call is slightly larger than a .223 cartridge so it will fit easily into your pocket. Hemlock Ridge Calls offers only the highest quality, most realistic sounding calls. Whether you are coaxing in a wary Tom with subtle turkey talk, locate a gobbler from a windy Appalachian ridge top, lure in a trophy buck or bag a cunning and elusive predator, a Hemlock Ridge Custom Game Call™ will get the job done. Every call that leaves our shop is guaranteed to realistically duplicate the game you are hunting. Ease of use, and exceptional tone quality and realism are the hallmarks of every Hemlock Ridge Custom Call.